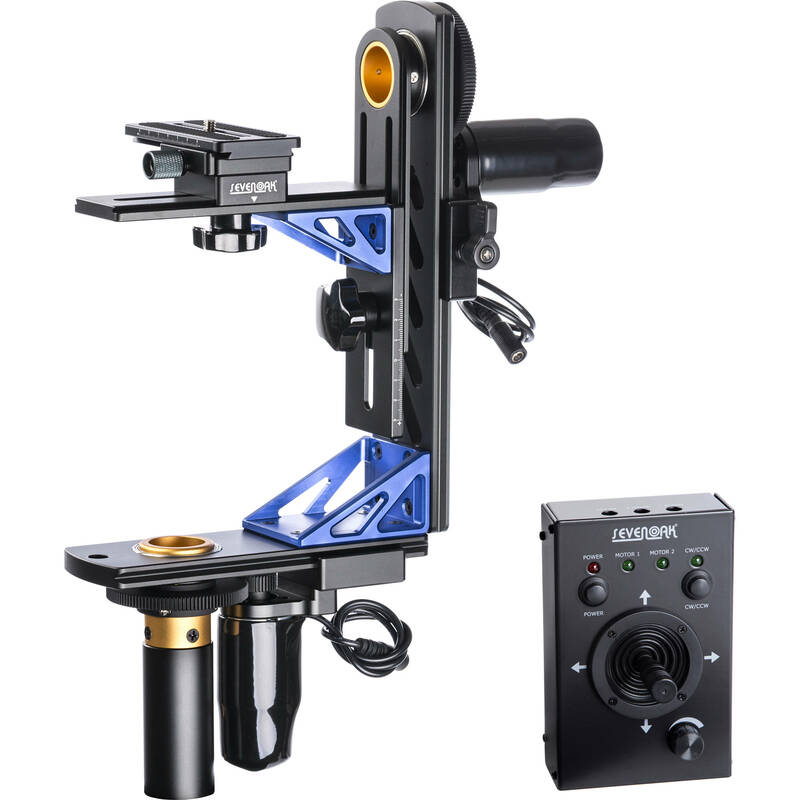 The Sevenoak Electronic Pan and Tilt Head Pro is a remotely operated head that offers continuous 360° rotation on both the horizontal and vertical axes. It offers wired joystick remote control from up to 20 ft away. The head supports 22 pounds of camera payload and features vertical and side-to-side adjustment for balancing your camera on the head. The unit comes with a wall-mounted AC adapter that provides 12 VDC and supports up to a 2A draw, which means you could use a professional battery (not included) to power the head. The head has a sliding camera plate that enables front-to-back balance adjustment and makes mounting and unmounting your camera easy. The bottom of the head offers 3/8"-16 and 1/4"-20 mounting threads for attaching to tripods, jibs, and other equipment. The remote-control box features a joystick and direction switches, as well as LED indicator lights. You can control the speed of the head from 0.5 to 3.3 rpm. An included bracket enables mounting the control box to jibs and cranes. Box Dimensions (LxWxH) 18.8 x 10.7 x 4.9"